I LOVE hot cocoa! It is so creamy and rich and decadent. 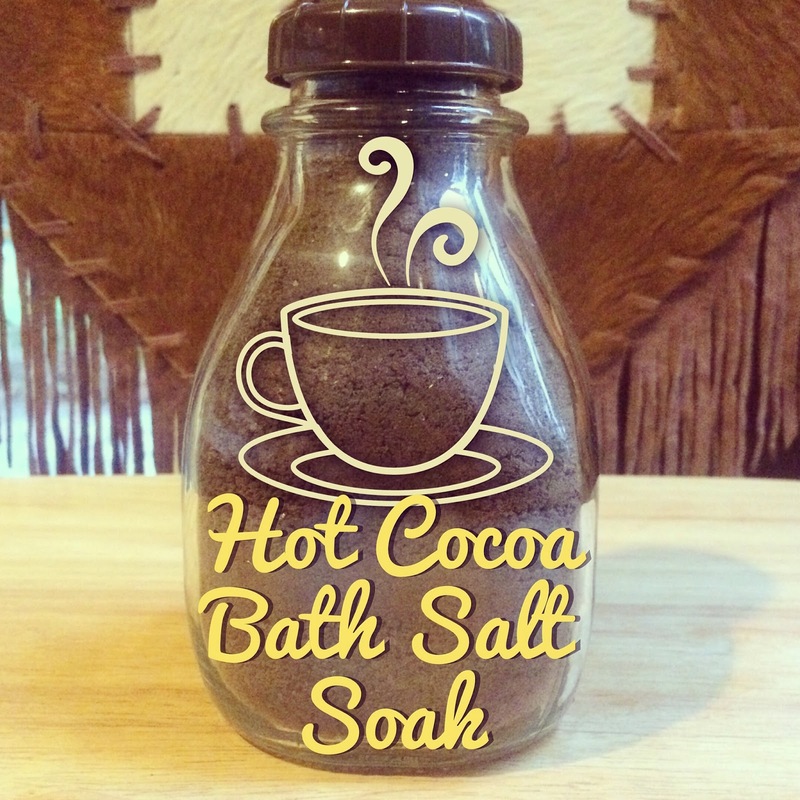 Have you ever wanted to take a bath in hot cocoa? Can you even imagine how wonderful and relaxing it would be to soak in a steamy hot cocoa infused bath? Indulge your senses with this recipe that will satisfy your chocolate craving without adding any calories to your waistline. 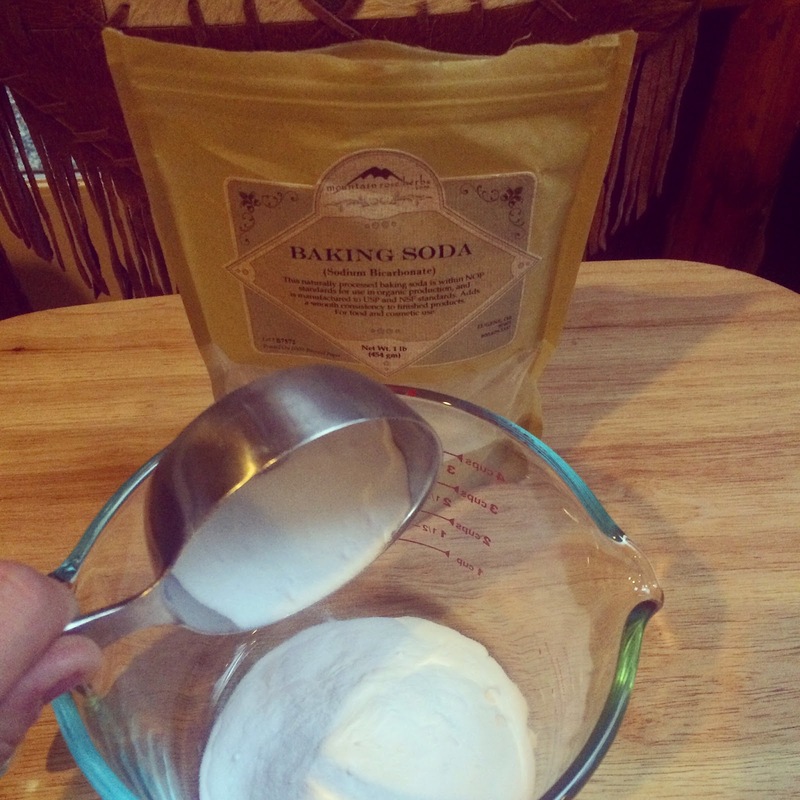 You will need 1/2 cup of Mountain Rose Herbs Baking Soda. You can find it HERE. 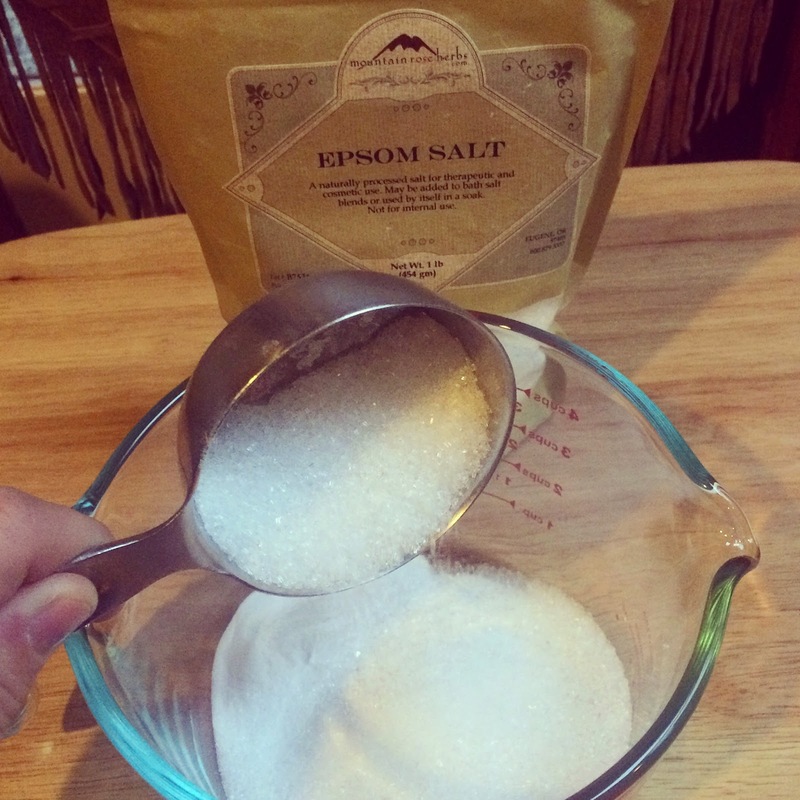 You will need 1 1/2 cups of Mountain Rose Herbs Epsom Salts. You can find it HERE. 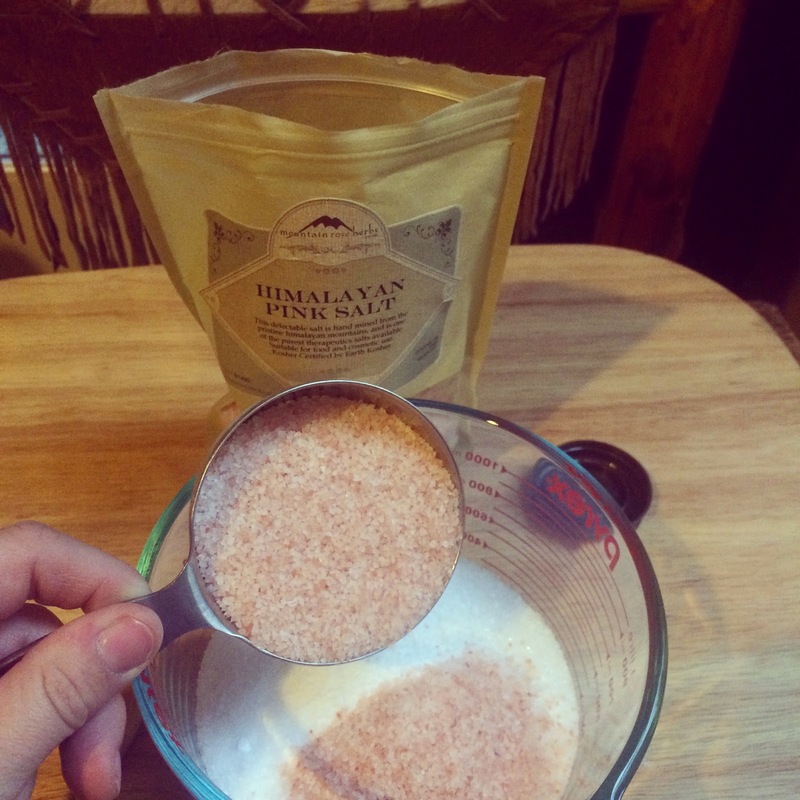 You will need 1/2 cup of Mountain Rose Herbs Himalayan Pink Salt. You can find it HERE. 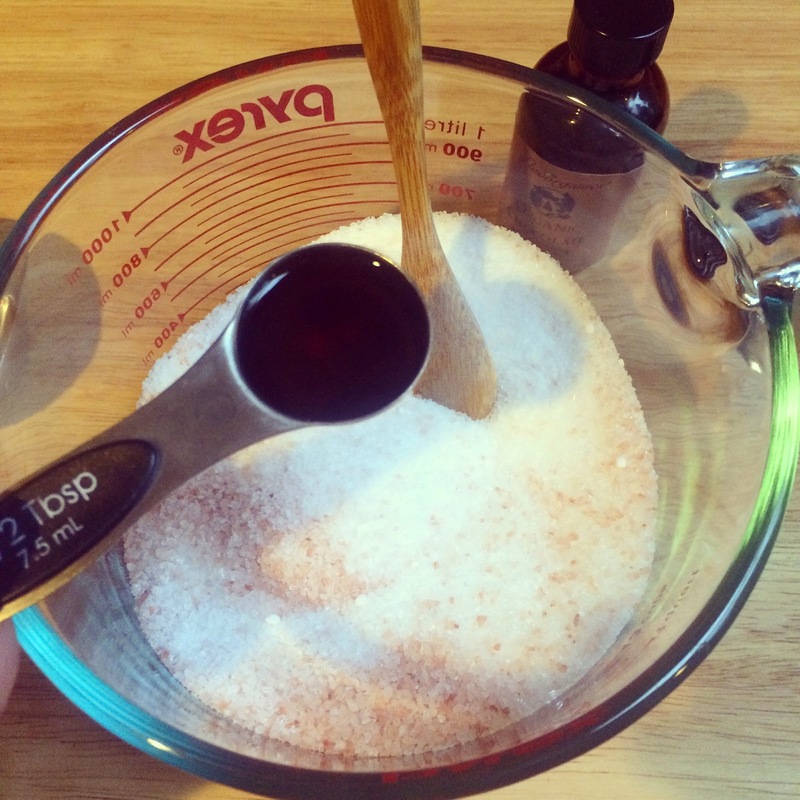 Combine the baking soda, Epsom salt and Himalayan salt into a medium sized mixing bowl. 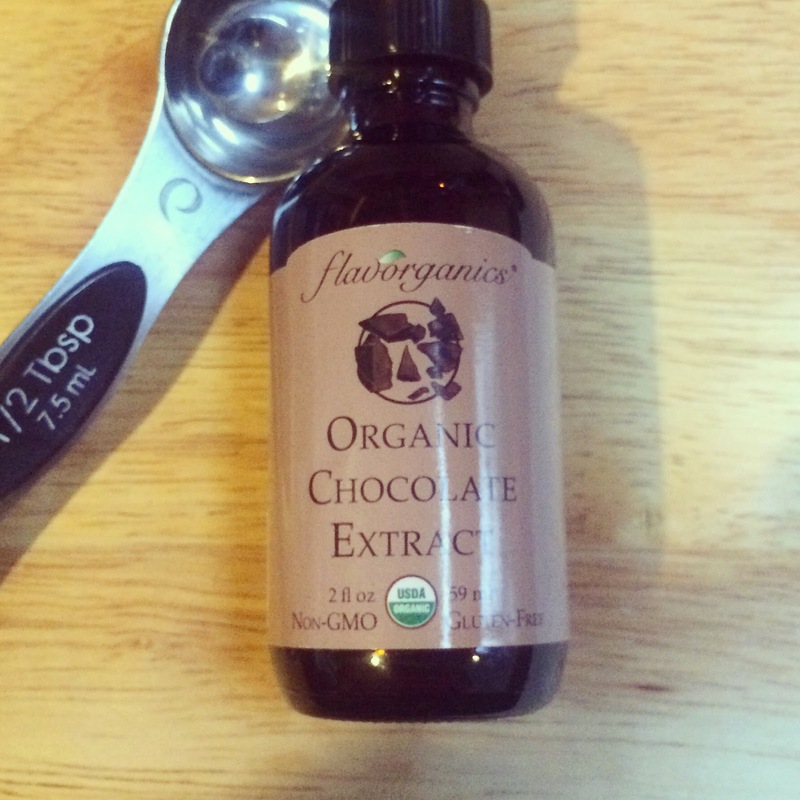 I used a 1/2 tablespoon of Organic Chocolate Extract to give the bath salt an extra kick of cocoa aroma. 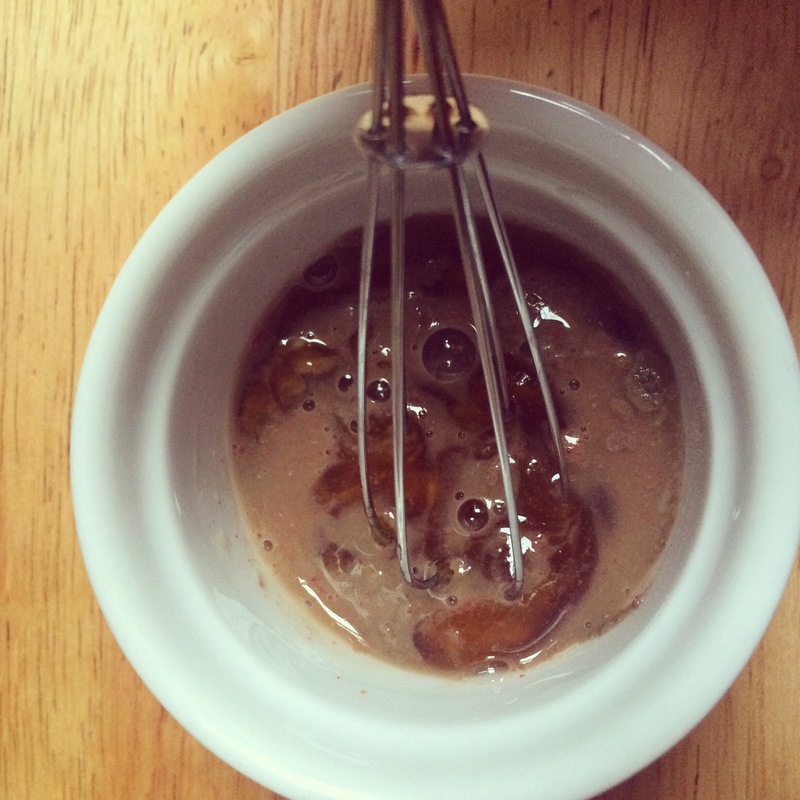 Drizzle the chocolate extract over the salt/baking soda mixture and stir well to combine. 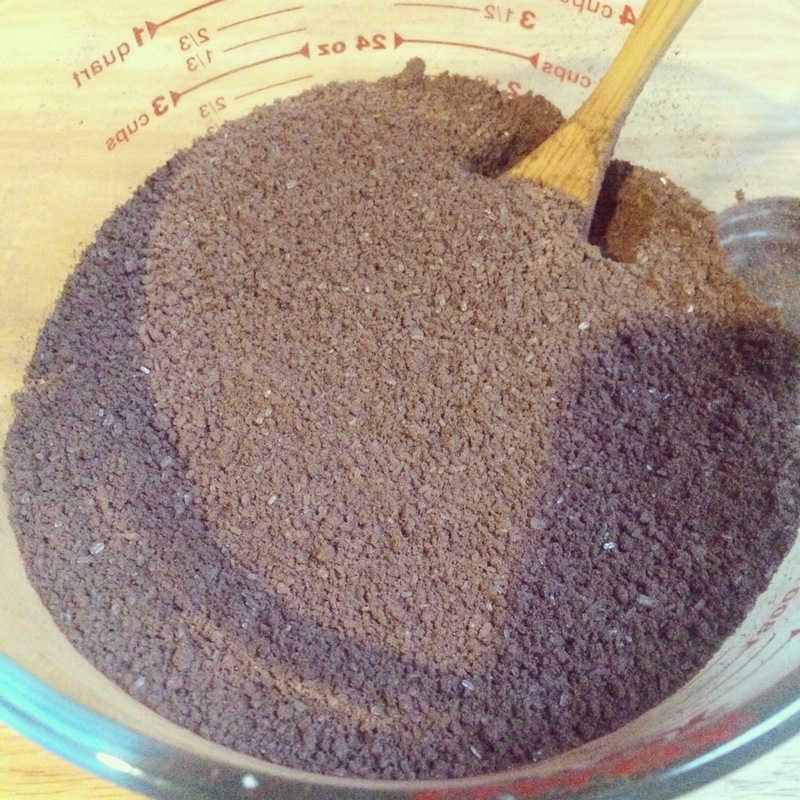 Add in 1/2 cup of cocoa powder and stir well to combine evenly. 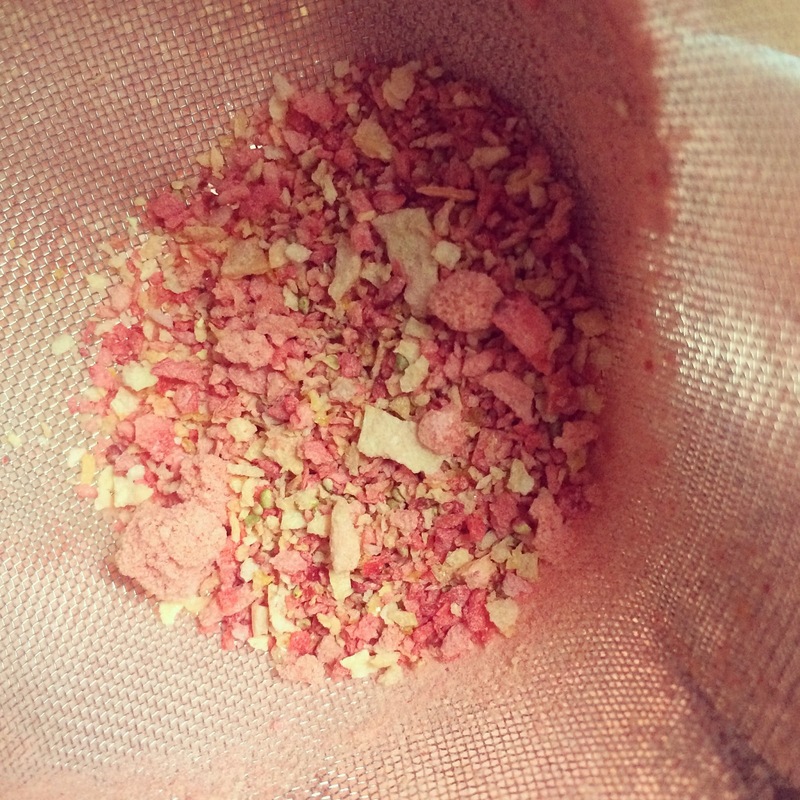 Your mixture will look like this when mixed properly. It smells delicious!!!! I thought it would be fun to fill up some glass milk bottles with the salt soak, but you can choose any container you like. Fun containers like the one in the photo above, make it super cute when giving as a gift. 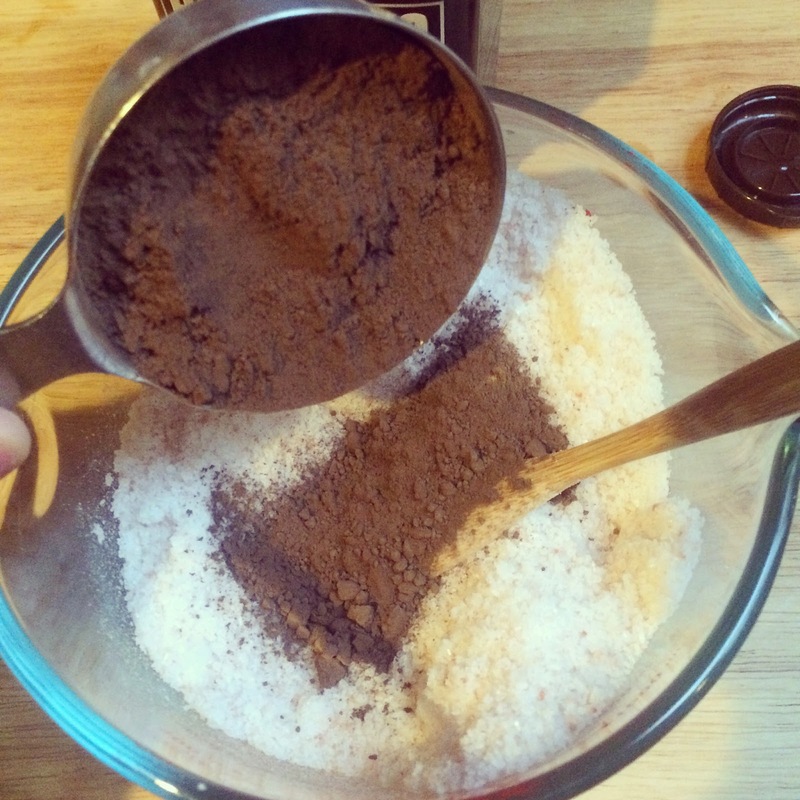 You simply add in 3/4 cup of the bath salt to a tub of warm water and swirl the water to mix. Enjoy the decadent cocoa aroma!!! You could also add in 1/2 cup of powdered milk for extra moisturizing properties if you like. 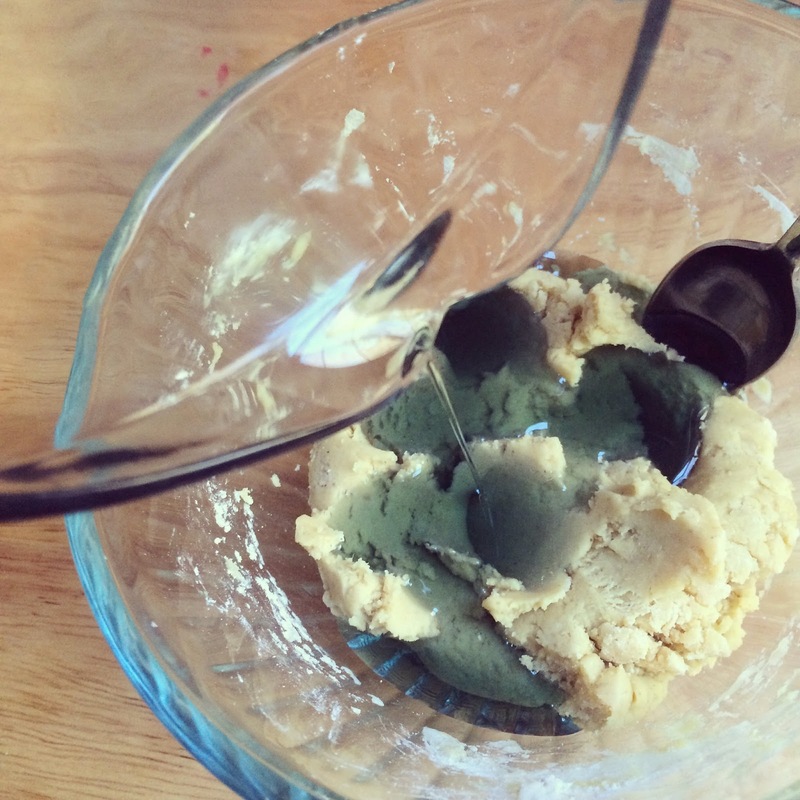 I was inspired to create this recipe by Lush's Putty for Your Hands Soap. I took a look at their listed ingredients on their website and got busy whipping up my own recipe using the same all-natural ingredients. I really LOVE this recipe and I have switched from my regular hand soap to this super moisturizing cleanser. My hands are always super dry in the cold months and this is such a wonderful way to wash my sensitive hands! I know you will LOVE this recipe so much!!! 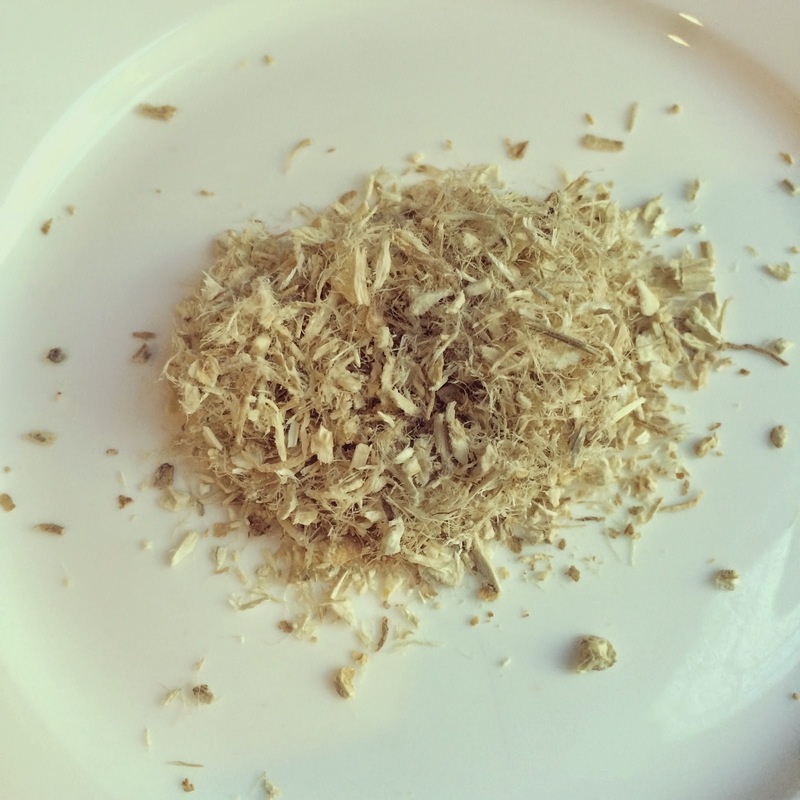 this is Marshmallow Root from Mountain Rose Herbs. 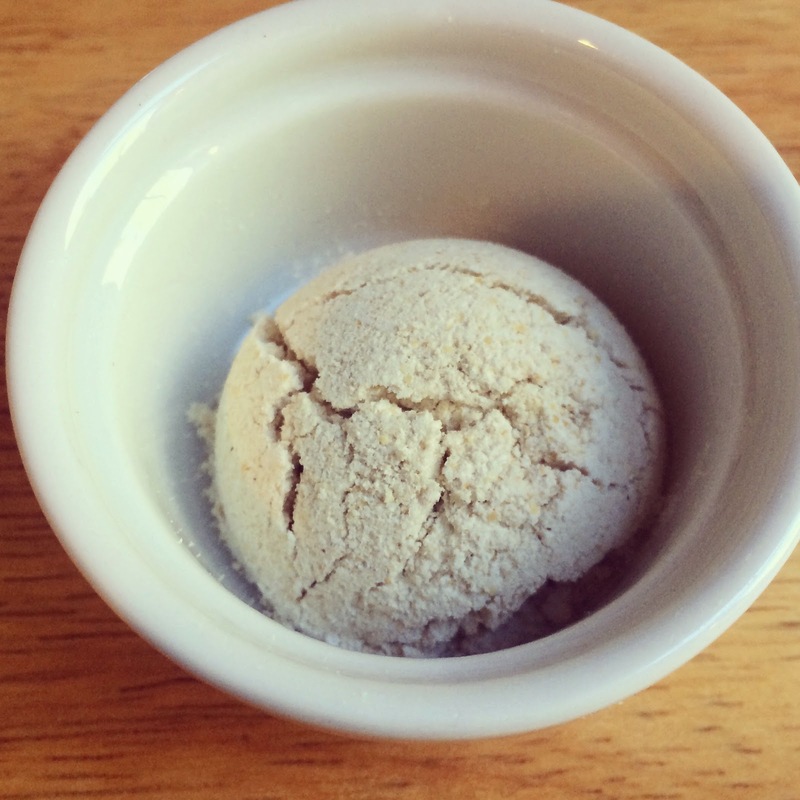 You will need 1 heaping tablespoon of ground dried Marshmallow Root from Mountain Rose Herbs. Marshmallow is a perennial herb native throughout damp areas of northern Europe and western Asia. It is now naturalized to the Atlantic coast of the United States and used as an ornamental for its pointed foliage and purple flowers. References to marshmallow root as a healing herb are found in Homer’s Iliad, written over 2,800 years ago. Its genus name Althaea comes from the Greek altho, to cure, and its order name, Malvaceae, is derived from the Greek malake, soft Marshmallow root was widely used in traditional Greek medicine. The use of the herb spread from Greece to Arabia and India, where it became an important herb in the Ayurvedic and Unani healing traditions. It is used in this recipe because it is very soothing to the skin and gives it the putty-like texture. I use a coffee grinder to grind the root into a fine powder. 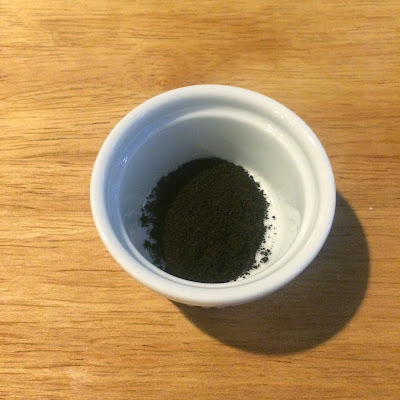 If you don't want to grind it yourself, Mountain Rose Herbs does offer it already powdered. You can find it HERE. Add the ground Marshmallow root and 1/4 cup of boiling water into a small bowl. Mix well and allow to cool to room temperature. You will have a thick paste. Stir in two tablespoons of Mountain Rose Herbs Vegetable Glycerine. This pure, certified organic, soy derived vegetable glycerine (glycerin) is used in cosmetics and body care products to assist in retaining moisture and is helpful in pulling oxygen into the skin. Vegetable glycerine is a natural emollient that adds a cooling effect on the skin and has become a predominant ingredient in most skin care products and soaps. You can purchase it HERE. 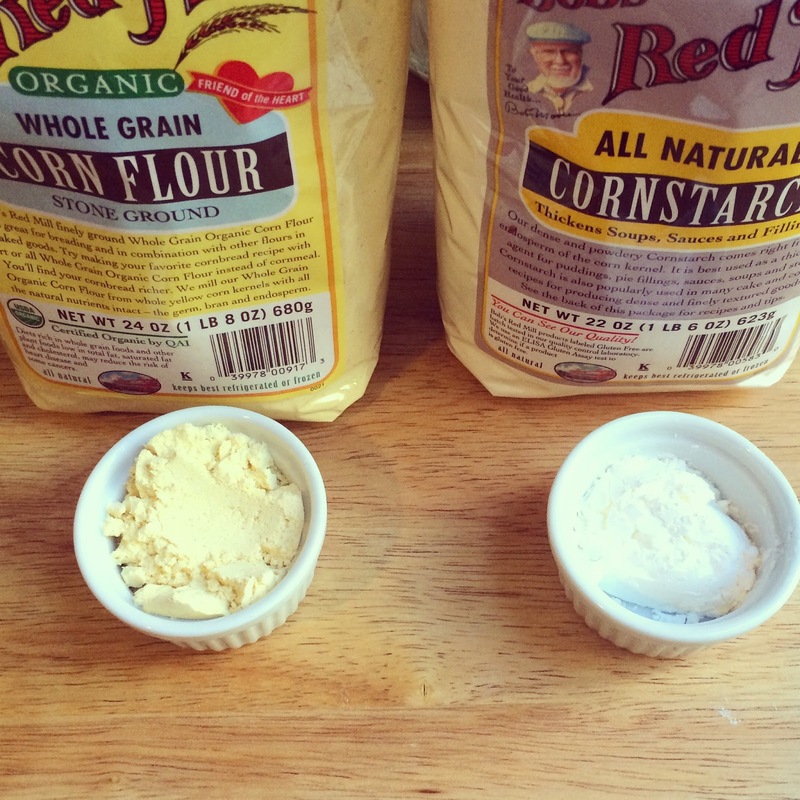 Measure out 1/4 cup of corn flour and 3 tablespoons of corn starch. 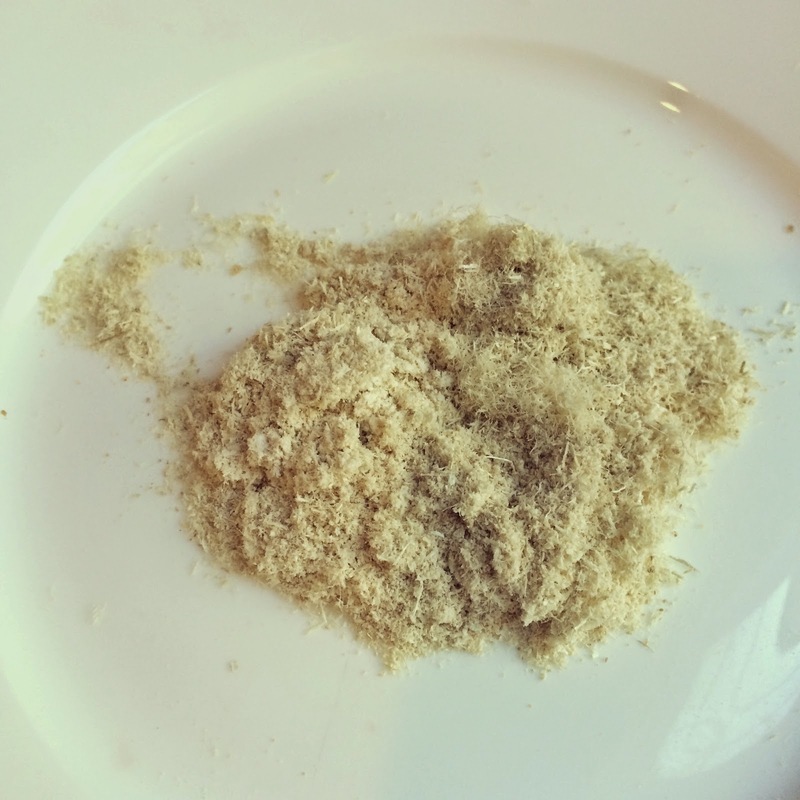 You will also need 1 tablespoon of ground oat flour. Stir the corn flour, corn starch, and oat flour into the liquid mixture until a smooth and thick paste forms. Set aside. Measure out 2 tablespoons of Mountain Rose Herbs Shea butter into a small heat-safe glass measuring cup. 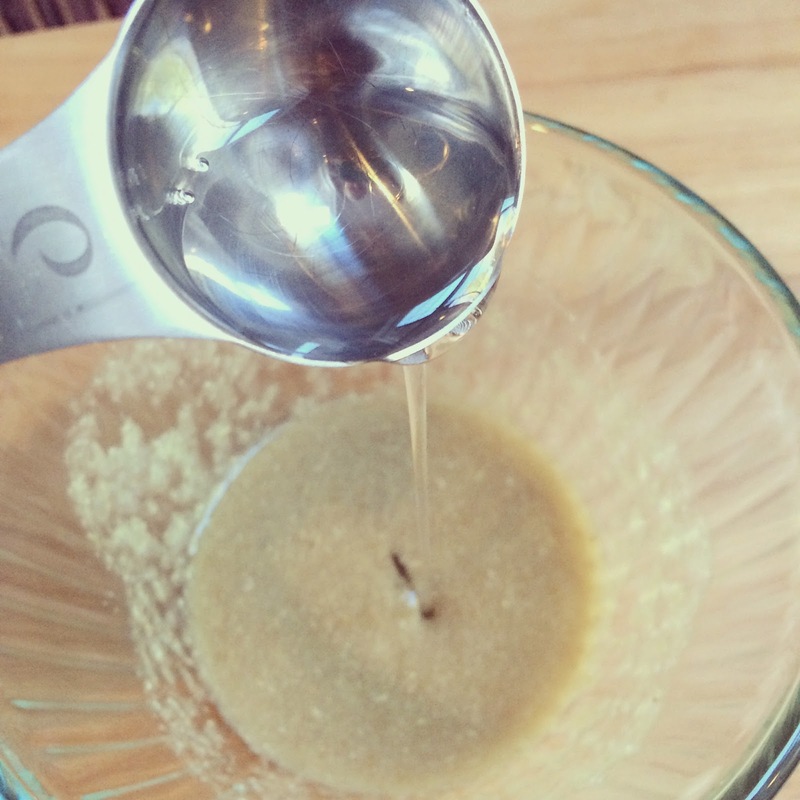 Place the measuring cup into a simmering water bath and melt the Shea butter. Add in the following Mountain Rose Herbs Essential oils to the melted Shea butter: 30 drops tea tree essential oil, 30 drops lavender essential oil, and 15 drops blue chamomile. Stir well. Pour the essential oils and Shea butter over the mixture and stir well to combine. 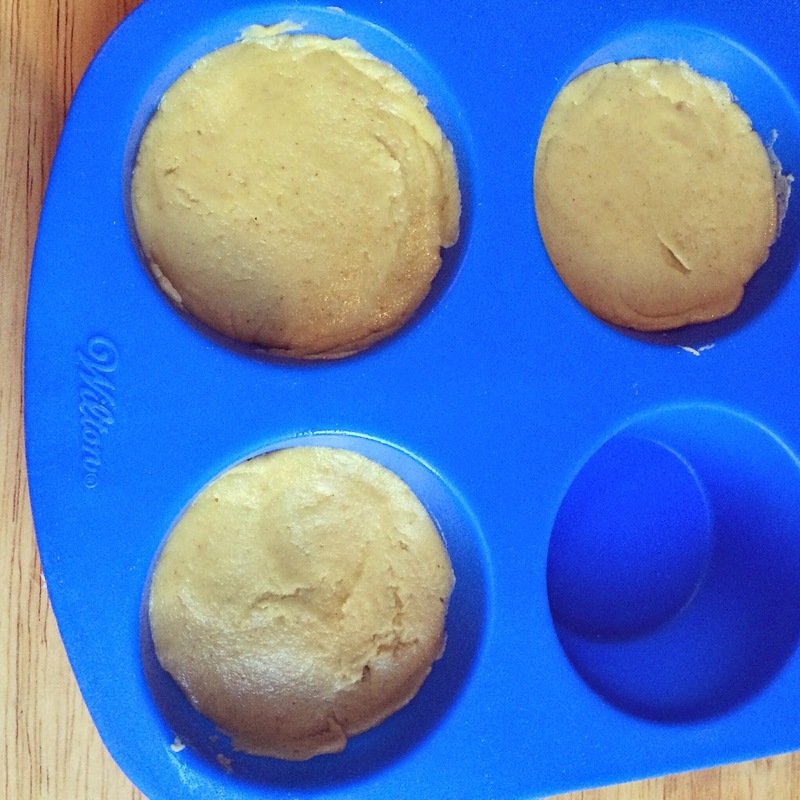 I placed the putty into small round silicone baking molds and allowed them to set up. 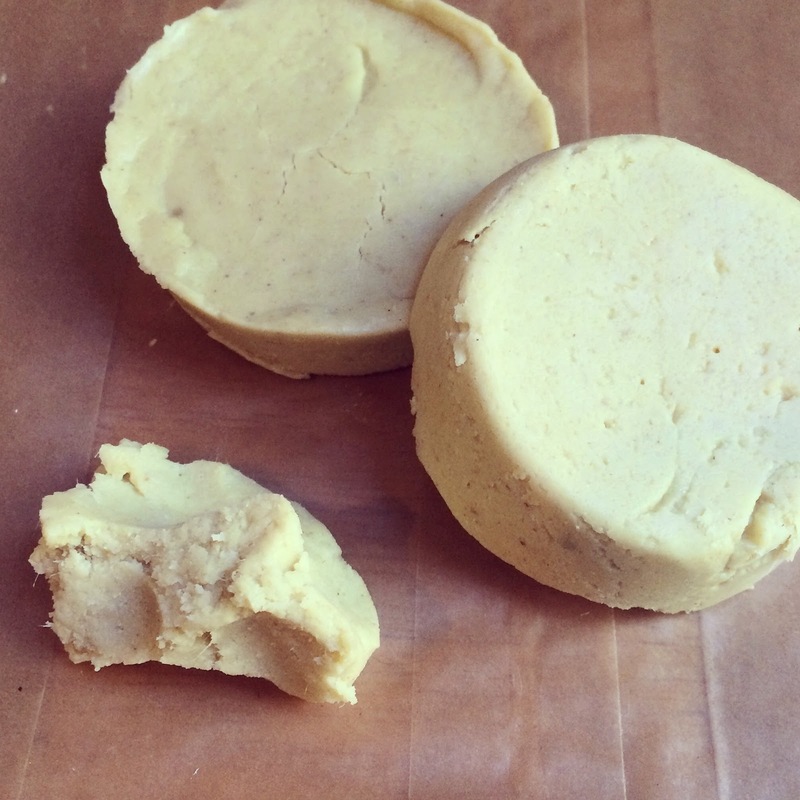 Once the Shea butter cools, it will firm up and you can push the discs out of the mold. My recipe does not include any preservatives so I put a day's worth into a small metal tin and I freeze the rest. 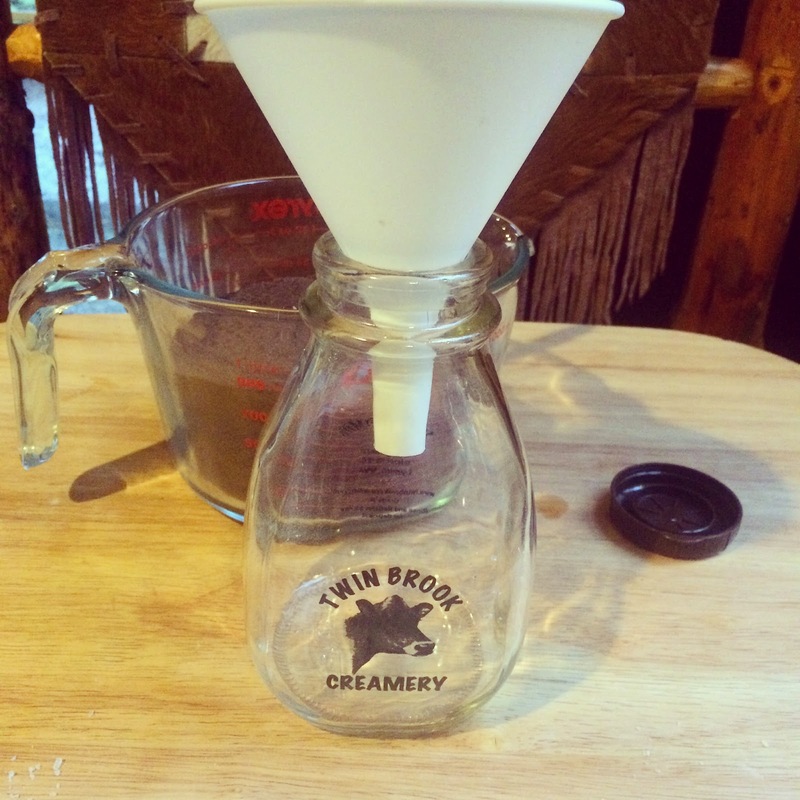 It chills to the consistency of ice cream and is easy to scoop out a little bit each day. I take a heaping teaspoon sized amount and rub it gently over my dry hands for about ten seconds. I then add a little bit of warm water and continue to massage the wash putty over my hands and then rinse away and gently pat dry. Your hands will be so soft by from the Shea butter and the other ingredients work to purify your hands. This information is for educational purposes only, it is not intended to treat, cure, prevent or, diagnose any disease or condition. Nor is it intended to prescribe in any way. This information is for educational purposes only and may not be complete, nor may its data be accurate. As with all herbs, do not take internally unless working with a qualified and expert practitioner. Keep away from children. I am an affiliate with Mountain Rose Herbs, please review my disclosure page for details. 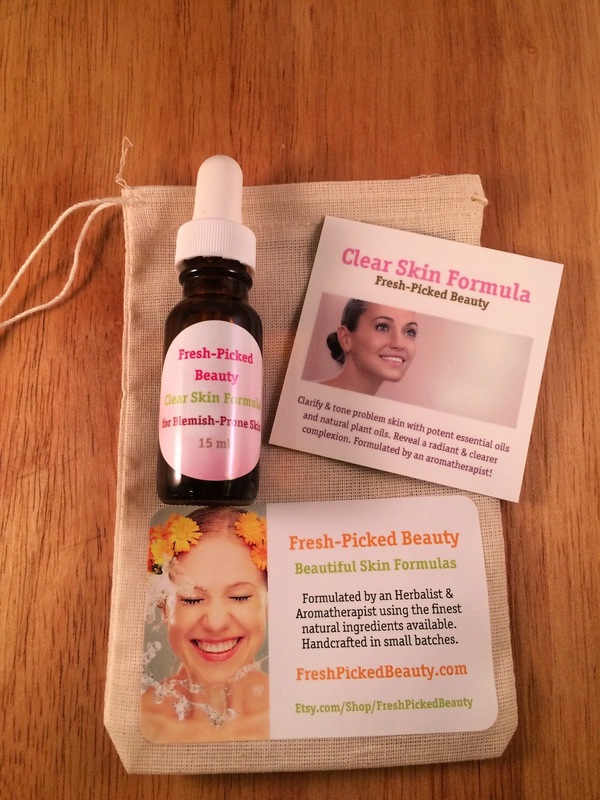 Shannon Buck and Fresh-Picked Beauty strongly recommend that you do not rely solely on the information presented on this website and that you always read labels, warnings, and directions before using or consuming any type product. Anything you find on this website still needs more research to establish the potential effectiveness and safety of any ingredient and/or suggestion. Before you consider using anything you find on this website, you need to consult with a medical professional to help you weigh the pros and cons of using natural ingredients. You also need to review all the available safety data for each ingredient before you use it. Herbs and natural ingredients have been used successfully for many years, but as a precaution, I suggest that you consult a naturopathic doctor, licensed herbalist, or holistic health practitioner who is qualified to guide you in the safe use of herbs and natural ingredients. These statements have not been evaluated by the Food and Drug Administration. This product is not intended to diagnose, treat, cure, or prevent any disease. I am not Affiliated with Lush in any way nor do I know their actual recipe for any of their products, I am simply using a list of ingredients and creating my own version. 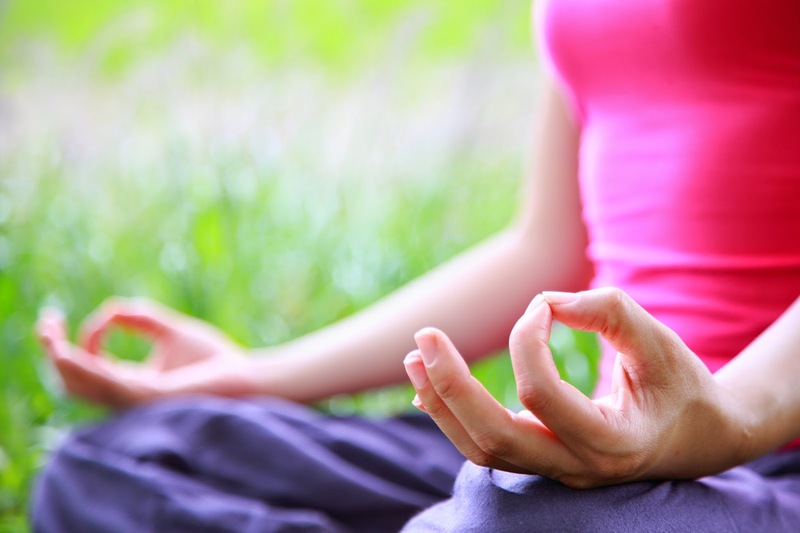 The following essential oils are often used to help promote good concentration and memory. They are usually diffused into the air or massaged onto the body. You can purchase them from Mountain Rose Herbs. Peppermint Essential Oil: Has many culinary and pharmaceutical uses. It is also used for its soothing qualities on the digestive system. Avoid in epilepsy and while pregnant. May cause skin irritation. Avoid with homeopathics. Mild climate stress in the growing conditions of the plant increases the oil content and sesquiterpene levels in the oil. Purchase from Mountain Rose Herbs HERE. Rosemary Essential Oil: Best known for its aid in memory and hair loss. It is also considered a symbol of love, and the sprigs have been traditionally used in wedding ceremonies. Rosmarinus is Latin for dew (ros) of the sea (marinus). Avoid in epilepsy, hypertension, and while pregnant. Avoid with homeopathics. 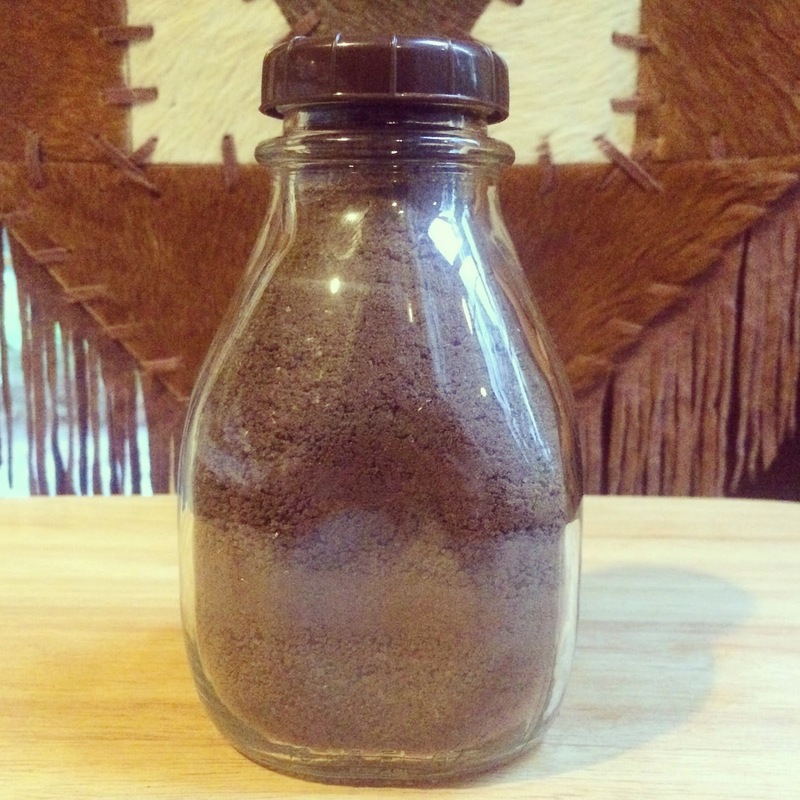 Purchase from Mountain Rose Herbs HERE. Lemon Essential Oil: All parts of the lemon have used around the house and medicinally. The oil has been used around the house as a cleaning agent, and medicinally it has an affinity with the digestive system. Lemons are harvested while they are still green to yield a higher quality oil. It takes over 3,000 lemons to produce 1 kilo (2.2 lbs) of expressed oil. May cause skin irritation. Phototoxic. Purchase from Mountain Rose Herbs HERE. Basil Essential Oil: Basil has many aromatic properties. Ocimum is derived from the Greek word osme, which means to smell. Avoid in epilepsy or while pregnant. May cause skin irritation. Basil is a sacred plant in India, and used in ayurvedic medicine. Purchase from Mountain Rose Herbs HERE. Eucalyptus Essential Oil: Eucalyptus is one of the oldest native medicines used in Australia. It is known now for its use in inhalants and vapor rubs, and as a household disinfectant and cleaner. The word eucalyptus is derived from Greek meaning “well covered”. This refers to part of the calyx that initially covers the flower. Avoid while pregnant and with homeopathics. May cause skin irritation. Purchase from Mountain Rose Herbs HERE. 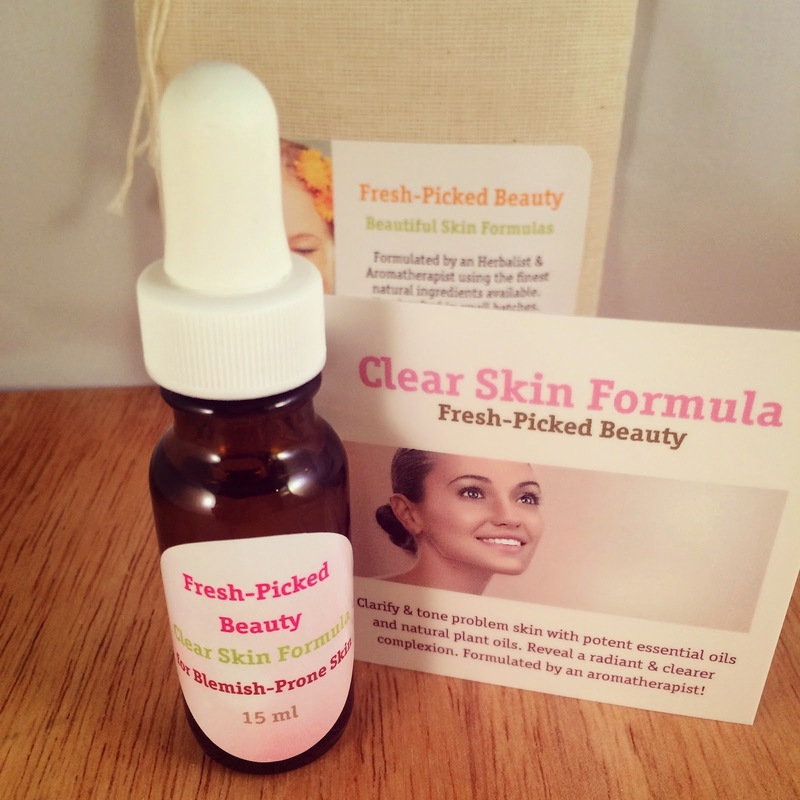 Clarify & tone problem skin with potent organic essential oils and natural plant oils. Reveal a radiant & clearer complexion. Formulated by an aromatherapist using the best ingredients for skin! This concentrated skin serum is fast absorbing and promotes a healthy balance to your skin. The smell of this serum is amazing and herbaceous and is perfect for every skin type. Buy it HERE on my Etsy Shop!!! Comes with a reusable cotton muslin bag!!! Directions for use: Massage a few drops into clean damp skin. Use morning and night. Avoid contact with eyes. If irritation or redness occurs, stop using and consult a health care professional. Keep out of reach of children. Not for use during pregnancy. Packaging: 15 ml amber dropper bottle packaged in a reusable cotton muslin bag. It is not intended to treat, cure, prevent or diagnose any disease or condition. Nor is it intended to prescribe in any way. This product has not been evaluated by the Food and Drug Administration. This information is not intended to diagnose, treat, cure, or prevent any disease. I encourage you to seek additional information about the safety of essential oils if you are new at using them. Keep your lips smooth and moisturized! 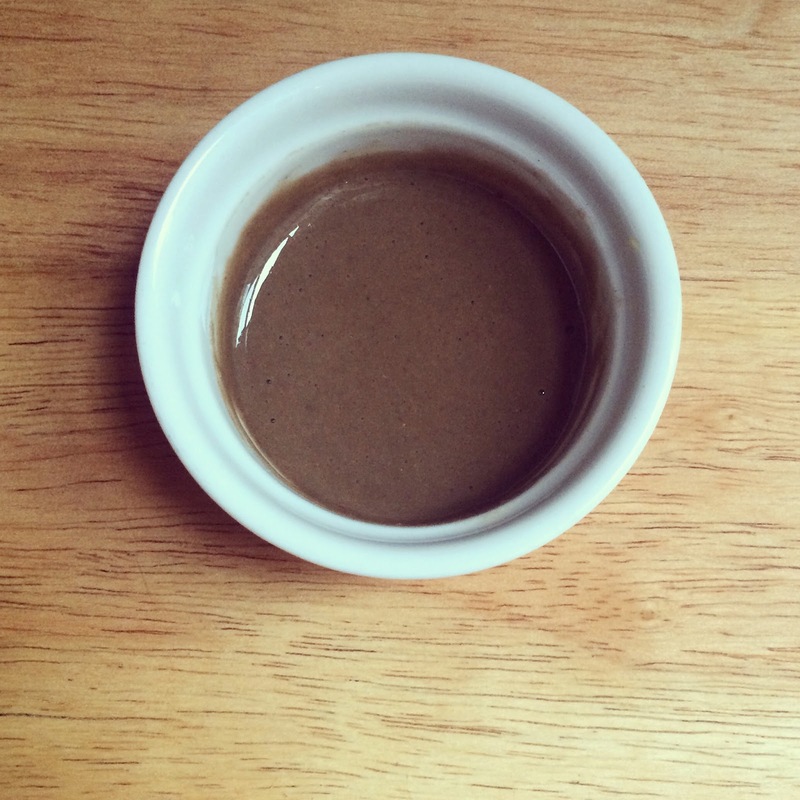 Here is a quick recipe that only needs four ingredients! My Pumpkin Vanilla Shea Lip Scrub is perfect for Winter-kissed lips that are parched and in need of some serious smoothing! You can make this in less than five minutes and the recipe makes enough to last you all Winter and into Spring! I used Mountain Rose Herbs Shea Butter, Caster Sugar, Organic Pumpkin Powder, and Pure Vanilla Powder. 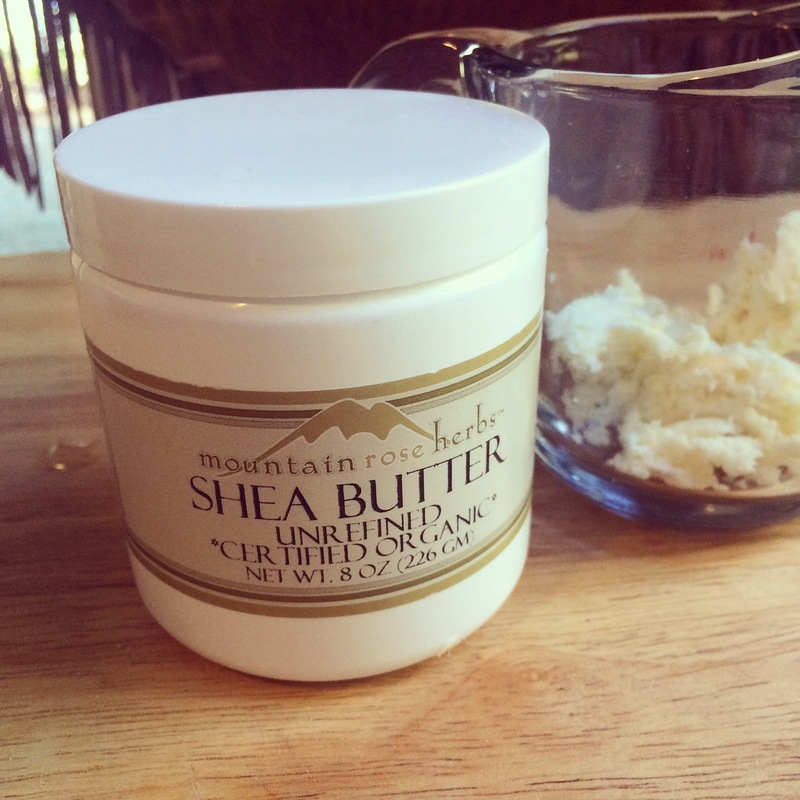 You will need 2 tablespoons of Mountain Rose Herbs Shea Butter. Shea Butter is becoming increasingly popular in the natural body care and cosmetic industries for good reason. It has been used for centuries in Africa for its moisturizing and healing properties, where it has been used to protect and condition skin which has been damaged. You can purchase it HERE!! 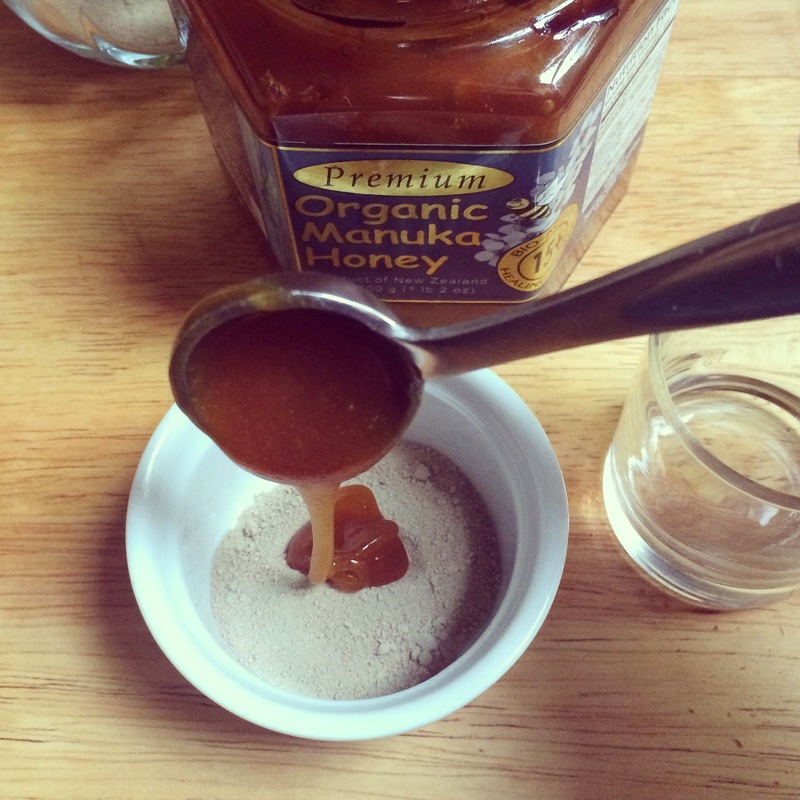 You will need 1 tablespoon of super fine white sugar, also known as "caster sugar". 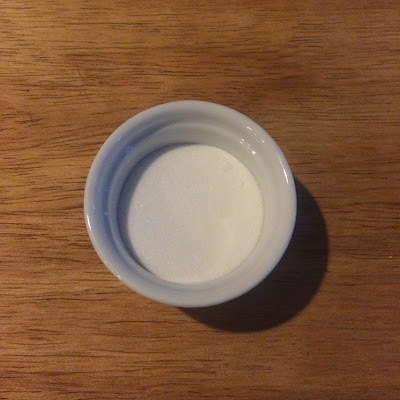 I like this fine grain sugar as it is very gentle on the skin and is appropriate to use on more delicate areas of the body like the face and lips. You need 1/2 teaspoon of powdered vanilla. I buy my powdered vanilla from Wilderness Poets and they have this to say about vanilla on their website...."Vanilla stimulates general feelings of well being. it is a known mood enhancer in aroma therapy. Vanilla is used medicinally to calm nerves and an upset stomach, its soothing fragrance helps to relax in moments of stress and anxiety." You will need 1 teaspoon of pumpkin powder. I like to include this as it provides a bit of exfoliating power to the recipe. Cream together the Shea butter and the caster sugar. Mix in the vanilla and pumpkin powders. 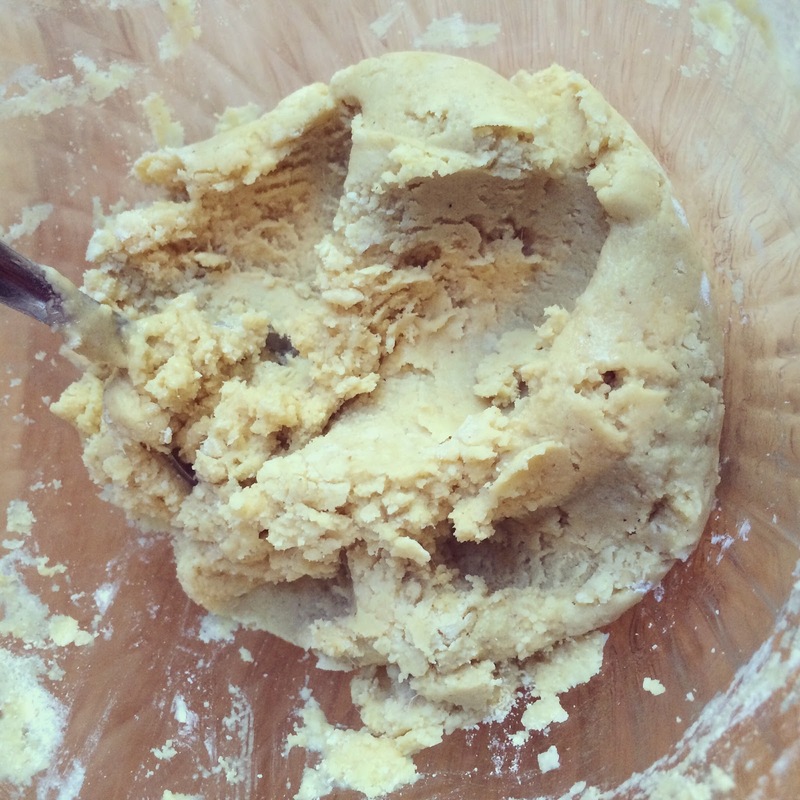 After a few days, the Shea butter will absorb the aroma from the vanilla powder and will smell absolutely decadent! 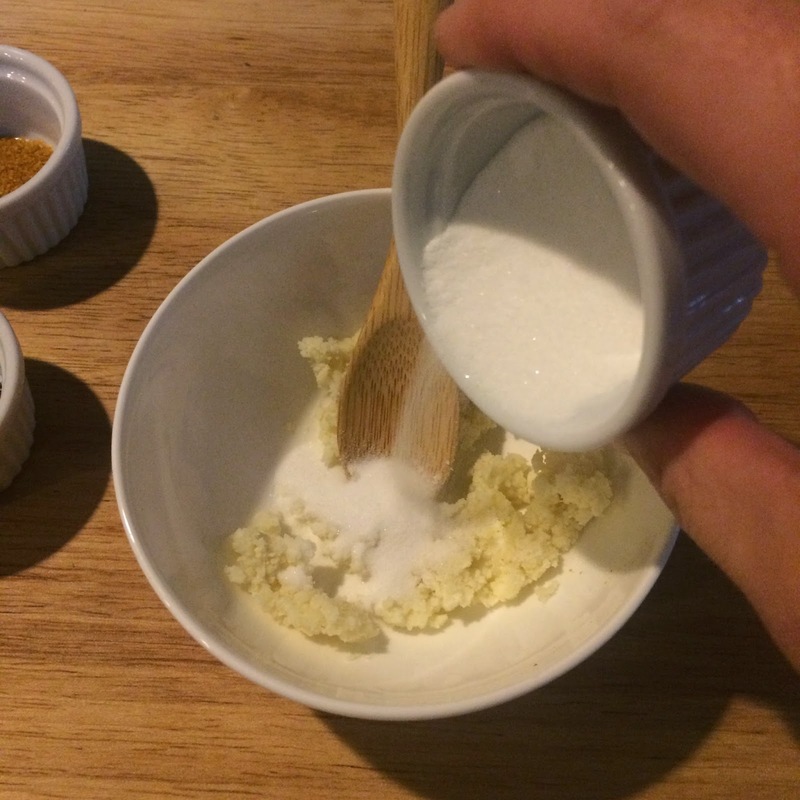 The photo above shows the ingredients mixed together properly. 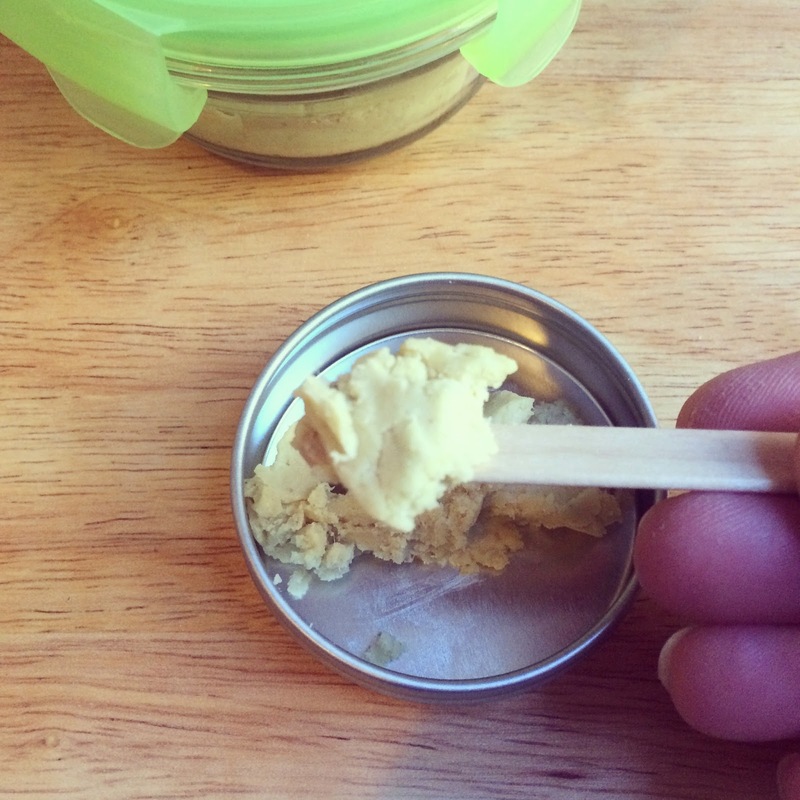 Transfer into a small container with a lid. To use: Before stepping into your shower, use a small pea sized amount and massage gently over your lips to exfoliate. Rinse away in the warm shower. Use several times per week or as needed. It has been raining NON-STOP around my neck of the woods and I am really staring to miss Summer! My face has been feeling rather dry since I turned on my furnace a few weeks ago and I needed something that would help brighten, exfoliate and moisturize my skin. 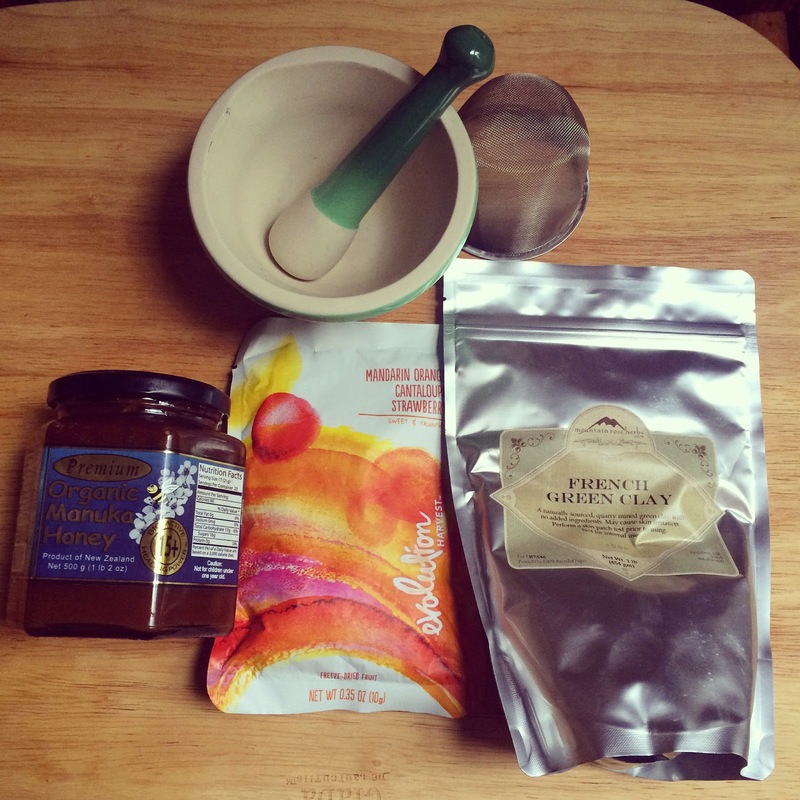 In true Fresh-Picked Beauty fashion, I started rooting around in my pantry and assembled some ingredients that promised to make a rejuvenating facial mask and had a Summertime-ish aroma of fresh squeezed orange juice and fruit. 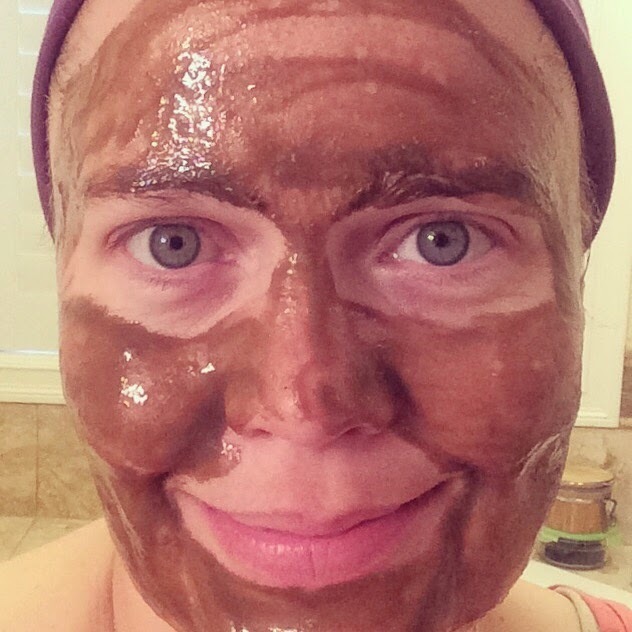 This facial mask also has some skin clearing clay and sweet & soothing Manuka honey. You will need some freeze-dried mandarin orange, cantaloupe and strawberry fruit blend (a single 10 gram package is perfect), you need Mountain Rose Herbs French Green Clay, Manuka Honey and fresh-squeezed orange juice. 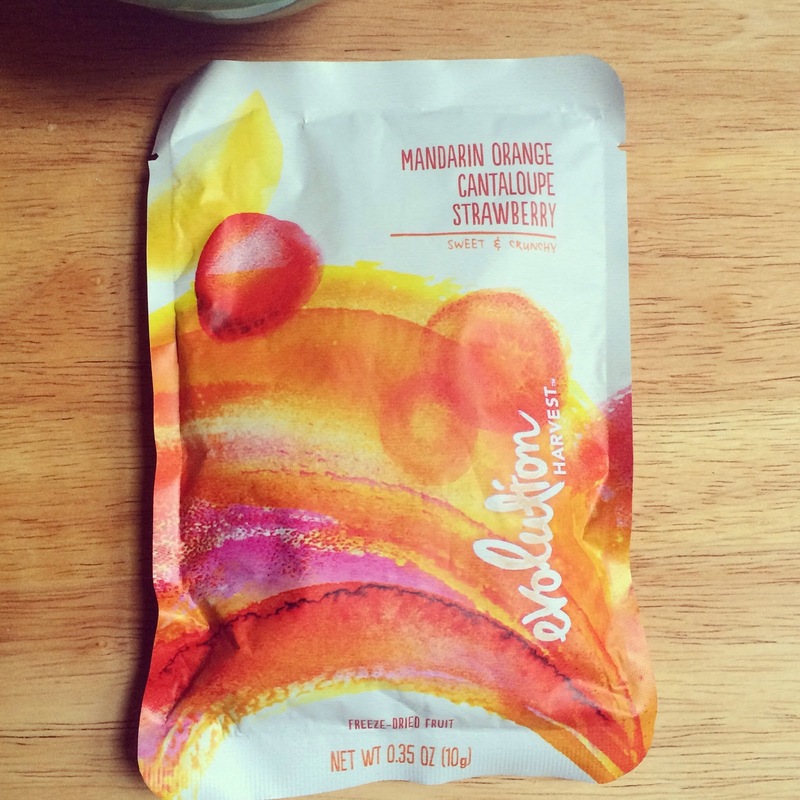 I like the Evolution Harvest freeze-dried fruit blend. I found this at my local Starbucks. 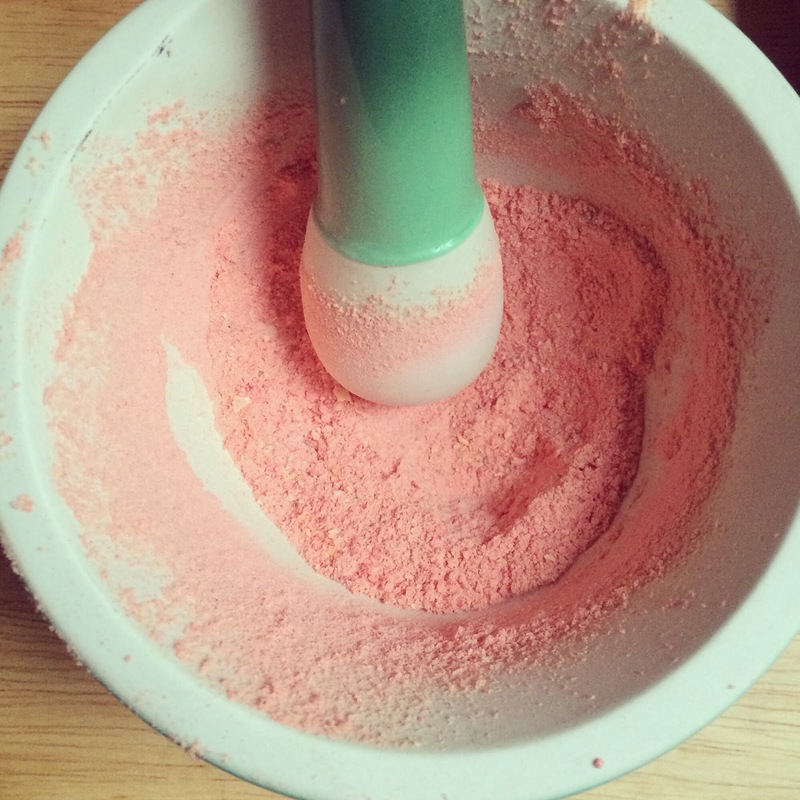 Finely grind the fruit into a powder in either a food processor or by using a mortar and pestle. Make sure it is ground into a super fine powder. 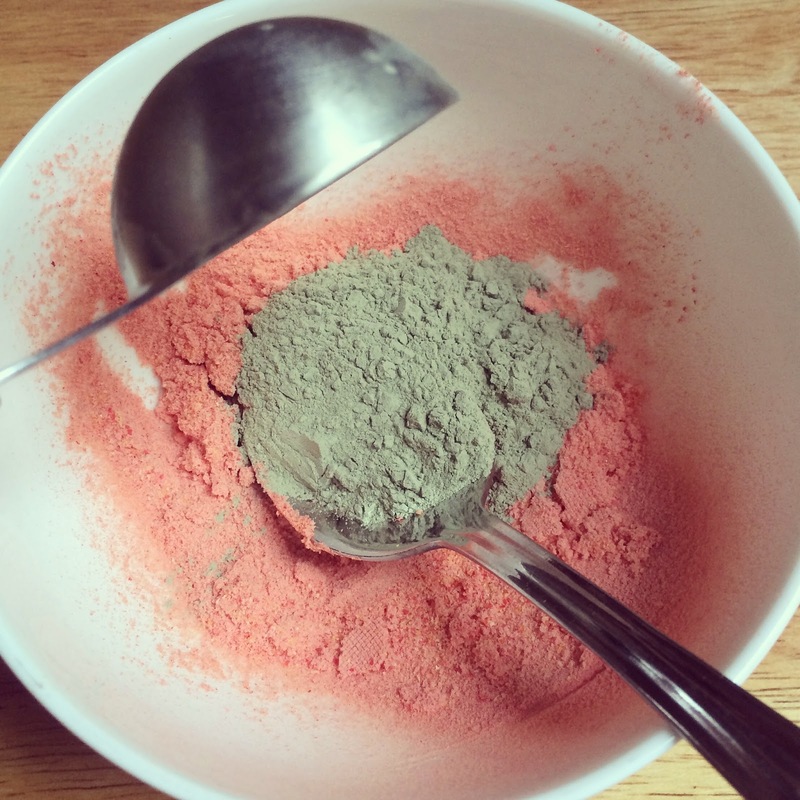 Your powder will be a beautiful soft pink and very fine when done correctly. It smells so good you will want to gobble it up....and you can if you like, but then you won't have any for the facial! 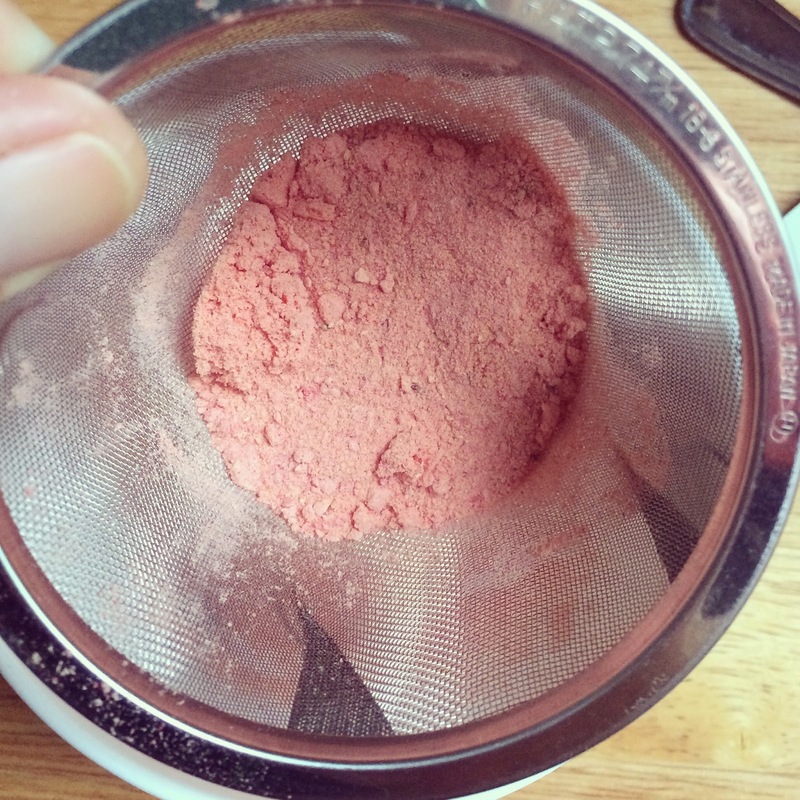 Sift the ground fruit powder through a fine mesh strainer to separate the seeds from the powder. Look at all the small bits and pieces of seeds and fruit that remained after I sifted it. 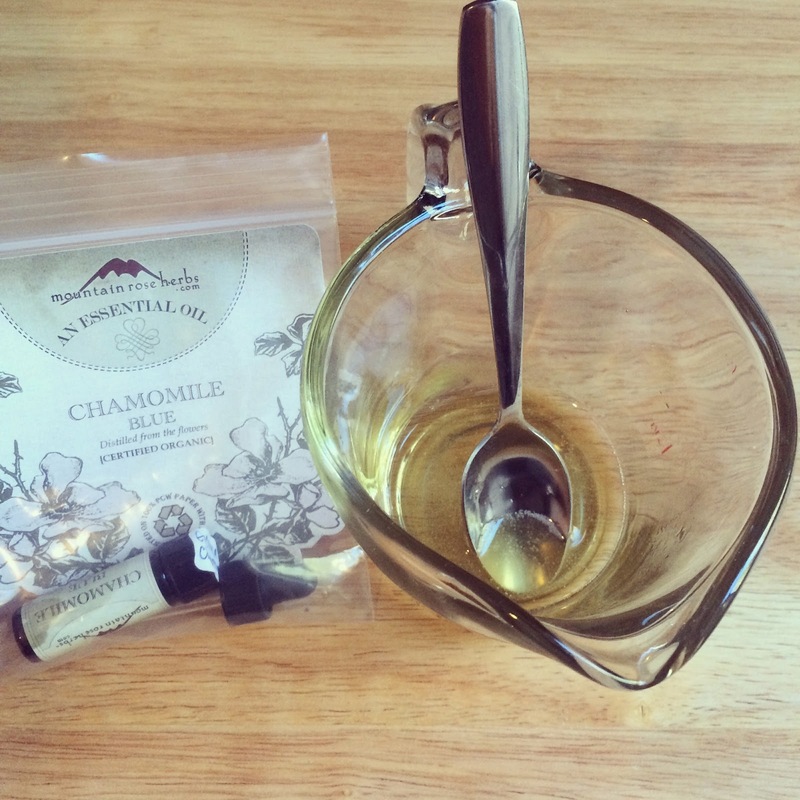 You don't have to toss this good stuff, simply add it to a tea bag for a fruity infusion. 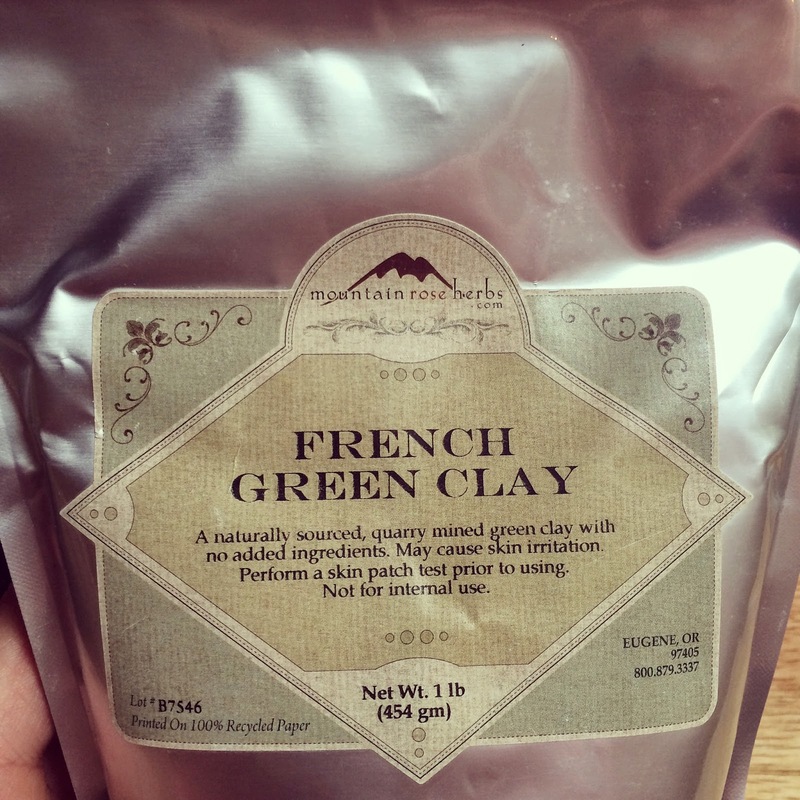 You will need 1 tablespoon of Mountain Rose Herbs French Green Clay. You can purchase it HERE. 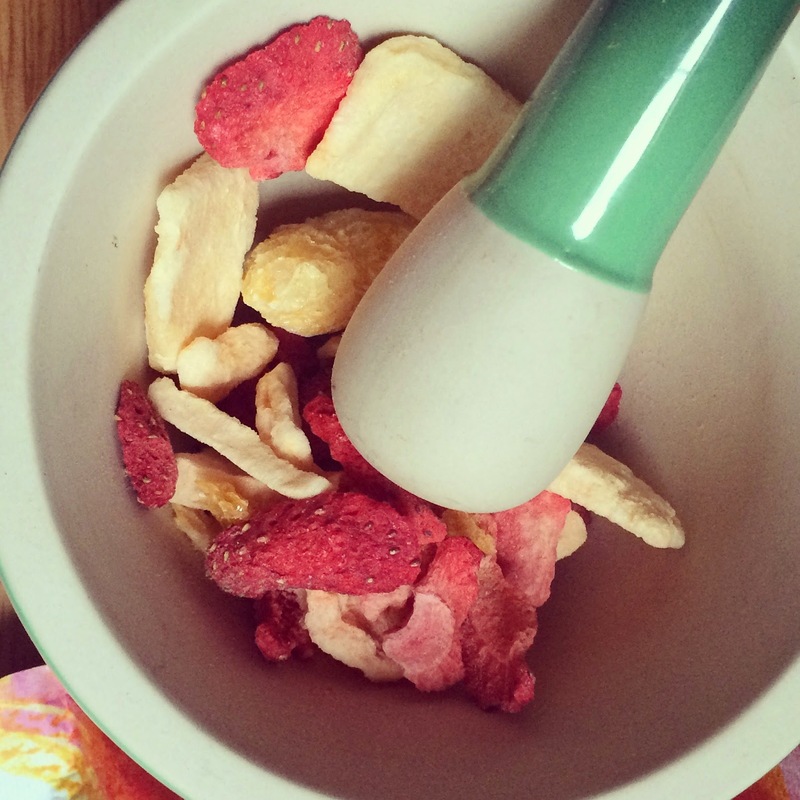 Mix the clay into the fruit powder. 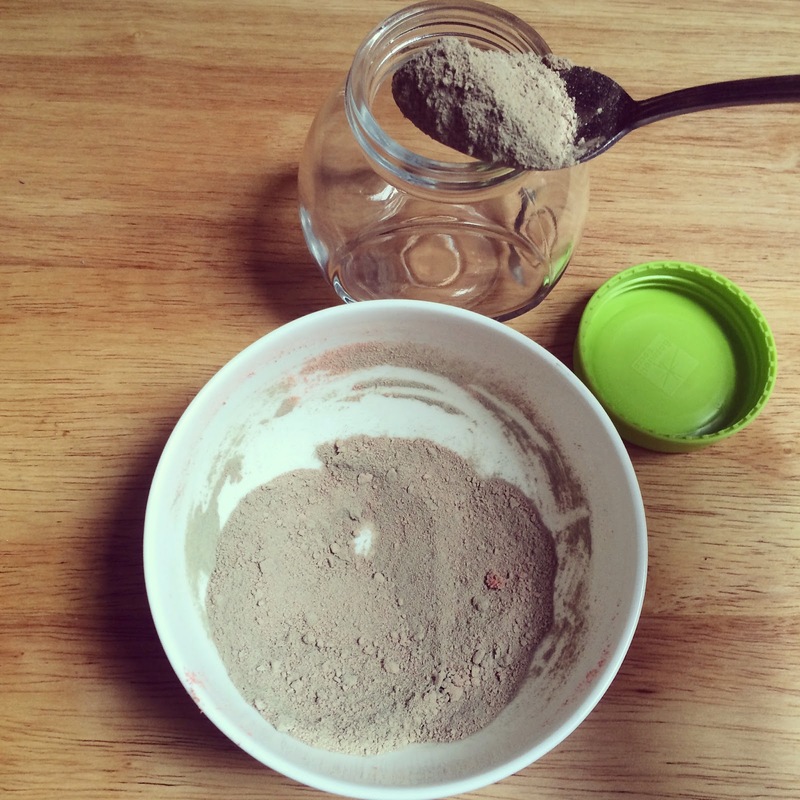 Add the clay/fruit powder mix into a small jar. This is your "stock" bottle of clay base. Keep a tight fitting lid on this. This will be enough for about 4 to 5 facials. 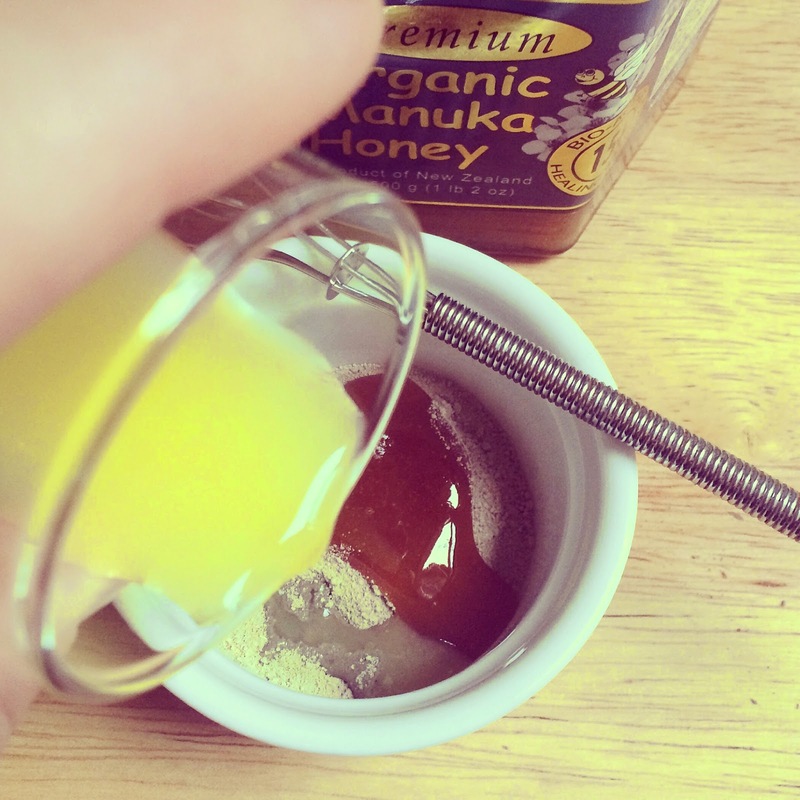 Measure out two teaspoons of the clay mix into a small bowl and add in one teaspoon of Manuka honey. Add in two teaspoons of orange juice and mix well. Whisk well to combine into a smooth paste. This smells so fresh and wonderful. The citrus aroma is very uplifting. Apply the entire amount to your clean skin and massage it in for about 1 minute. Leave it on for up to 20 minutes and then rinse away with warm water and moisturize as usual. 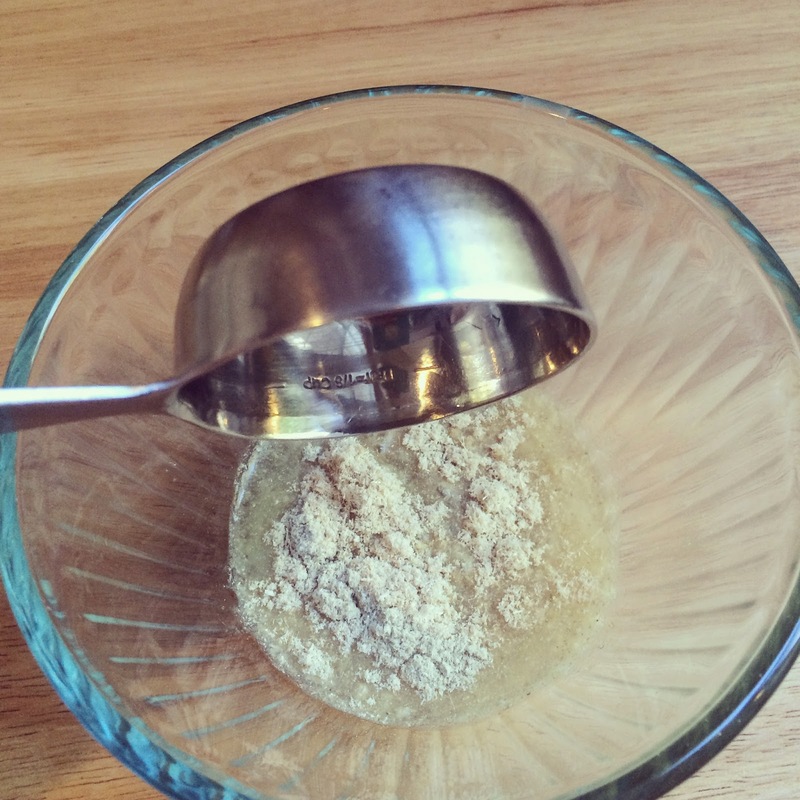 You can use this facial mask up to three times per week. This information is for educational purposes only, it is not intended to treat, cure, prevent or, diagnose any disease or condition. Nor is it intended to prescribe in any way. This information is for educational purposes only and may not be complete, nor may its data be accurate. As with all herbs, do not take internally unless working with a qualified and expert practitioner. Keep away from children. I am an affiliate with Mountain Rose Herbs, please review my disclosure page for details. Shannon Buck and Fresh-Picked Beauty strongly recommend that you do not rely solely on the information presented on this website and that you always read labels, warnings, and directions before using or consuming any type product. Anything you find on this website still needs more research to establish the potential effectiveness and safety of any ingredient and/or suggestion. Before you consider using anything you find on this website, you need to consult with a medical professional to help you weigh the pros and cons of using natural ingredients. You also need to review all the available safety data for each ingredient before you use it. Herbs and natural ingredients have been used successfully for many years, but as a precaution, I suggest that you consult a naturopathic doctor, licensed herbalist, or holistic health practitioner who is qualified to guide you in the safe use of herbs and natural ingredients. These statements have not been evaluated by the Food and Drug Administration. This product is not intended to diagnose, treat, cure, or prevent any disease. 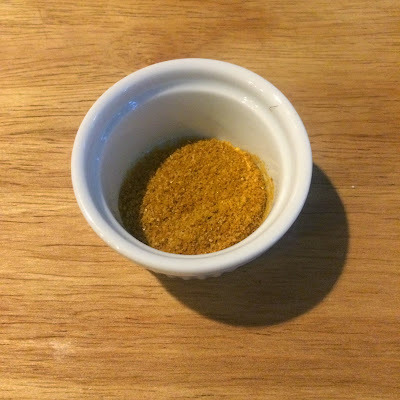 I am not in any way Affiliated with Lush in any way nor do I know their actual recipe for any of their products, I am simply using a list of ingredients and creating my own version.